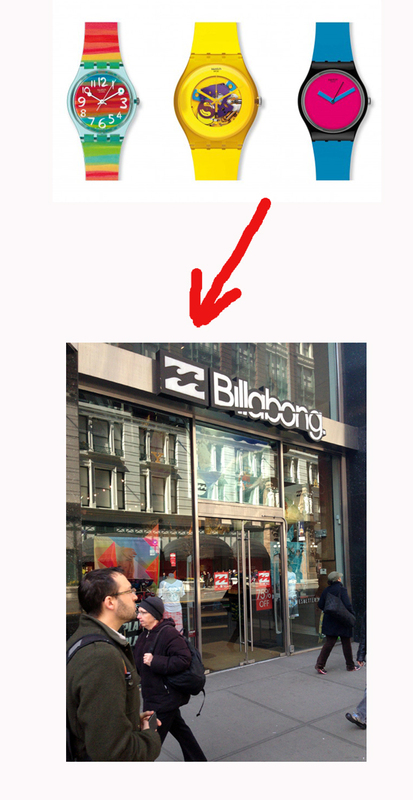 According to a story in Crains New York today, Swatch is taking over the Billabong space at 112 West 34th Street. The Crain's story also claims 34th Street now joins "... Fifth Avenue, Times Square, Madison Avenue, and most recently, SoHo, in the $1,000-a-square-foot-and-up club." We are honored, indeed. Also, this is the second story in a week I've read about the "retail renaissance" of Herald Square. We're practically trending. Back to Swatch: rumor has it we'll be shopping 112 W. 34th not just for Swatch's iconic plastic watches, but also for the company's other brands like Tissot and Longines. I could definitely see that happening on the second level of the 1,800 square foot store. As an early adopter of the classic black Swatch watch, I'd like to say Welcome, Swatch, to 34th Street!